As we head outside during the summer months to enjoy the warm weather, barbecues and picnics, look who else is out enjoying the outdoors – ANTS. Just when you are enjoying your summer vacation, ants show up on your patio and in your garden, trailing and nesting in your yard and home and drive you crazy. When it gets too hot and dry, ants sometimes seek food, water and shelter indoors. 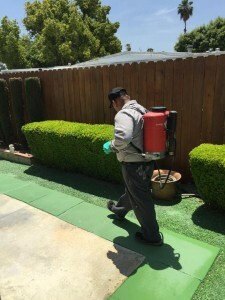 AmeriGuard Pest Defense provides exterior and interior ant pest control services for residential and commercial locations. The most common ant invading residential structures in southern California is the Argentine ant. Argentine ants feed on sweets and proteins and nest outdoors in shallow mounds. When ants invade a home, they usually do so in bathrooms and kitchens were water and food are plentiful. Most over-the-counter ant control products repel ants instead of treat the problem at the source, which is the nest. AmeriGuard Pest Defense technicians are trained to identify the ant species and locate nesting sites and hiding places. Our effective ant pest control strategies ensure that ants are eliminated from your home so you can go back to enjoying your summer without these uninvited nuisances. AmeriGuard Pest Defense is so confident that we will get rid of your summer ant pest control problem, that we extend a 30-Day Guarantee. Call (951) 652-0505 to schedule your ant service today.